As we begin our summer workouts through July, let me WELCOME all the Freshmen and first year Football Parents to our football program. I look forward to our future together as you and your sons make their mark and take their place in the St Francis Prep Football Community. We look forward to your participation and to your son’s contributions in our culture, his representation of our program at home, in society and in the Prep community. But of course, we look forward to his participation as a great teammate, his development into a fine young man, his contributions in our summer workouts, weekly game preparation and the vigorous competition that the CHSFL has in store for us. Through the efforts of our Athletic Administration, I am excited to announce that there will be NO CHANGE in our FOOTBALL FEE from last year. $475.00 will be submitted to Coach Kelly. Due on DAY 1, August 16th. If you are paying by check or money order, make it payable to: St. Francis Prep. Please put your son’s first & last name & “Football” in the memo. If you are paying in cash, Coach Kelly will issue you a receipt. If there are any further questions regarding scheduling please contact Head Freshman Coach Clark LeMelle (347)404-0449. 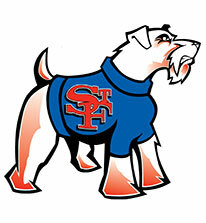 On for Ol' St Francis! !